Re: 35 Anniversary Collectors ponies - Thread 3! They are sooo beautiful!!!! love your pics!! I got them! I got them! and they're soo lovely! Maaan, are they beautiful! I wanted to share my joy by showing you some pics but they don't make any justice to these beauties. A special thanks to Bibi whose incredible help has made my dreams come true by getting me the second wave Rainbow Ponies. An important thing to note is that you can actually check the stock for each pony. I hope this might help to all those European folks who haven't had the chance to get them or won't be vey likely to in their home countries (mine for instance). Very pretty!! They look great all together. It seems wrong that Spain aren't getting them in stores, not least because so many Spanish collectors asked about them! Was that the original Collector pony six or a different set? Entertainer here hasn't had any ponies for a while but they're meant to get the parlour I think...? Smyths also has them now. But I checked Debenhams this morning and nothing. Not that I'm surprised given Debenhams is currently in some strife financially...but it was worth a look. Hi everyone, I haven't been here in ages but omg I seriously need some of these ponies!  Has any one seen them in Germany or any information about them xoming to Germany? Have you tried www.webhallen.com ? They ship to Nordic countries and Germany only. So far they have the first Rainbow set, the 5-pack set too and the 4-Classic set. Actually, the 4-Classic set is 14% off. My hubby ran to a Target that is about 20 ish minutes away from us (I believe we have six total in the area) and he found Trickles, Confetti and Tickle. No sign of Flutterbye. I went to our Target tonight and they still had the sitting Earth ponies. Someone had bought out the collectors and first wave rainbows again. Amazon.de has many of them, though not all. I haven't been able to find Tickles, Pinwheel or Starflower. Pinwheel and Starflower are not out yet. Does Amazon.de have preorder dates etc for the Unicorn and Pegasus set too? Ahh, so that's why I haven't seen them yet! thank you! Is there a list somewhere that has the release dates? My Google-Fu seems to elude me on these ponies. I've ordered Starshine, Windy, Skydancer and the collector's pose ponies via Amazon.de, and they arrived within 1-2 days. Pricewise, they were between 17 and 20 Euro. Parasol, Moonstone, Sunlight, Confetti and Flutterbye are available via Prime, too, and they also have a listing for Tickle now via a seller, so not from amazon directly, that lists 4-5 days for delivery. Proshop.de has the earth ponies as well, I've ordered Seashell there a while back. They are a bit cheaper there, with Sunlight going for under 10 Euros in the "demo" version and Bubbles and (regular) Sunlight are even on Easter sale for € 10,20 and € 12,30. Delivery takes 1-3 days usually. I shouldn't have checked, I swore to myself not to go pony shopping until my next invoice has been paid by my client buuuuuut hey, it's an Easter sale, so I'll be getting Bubbles and Sunlight next week... 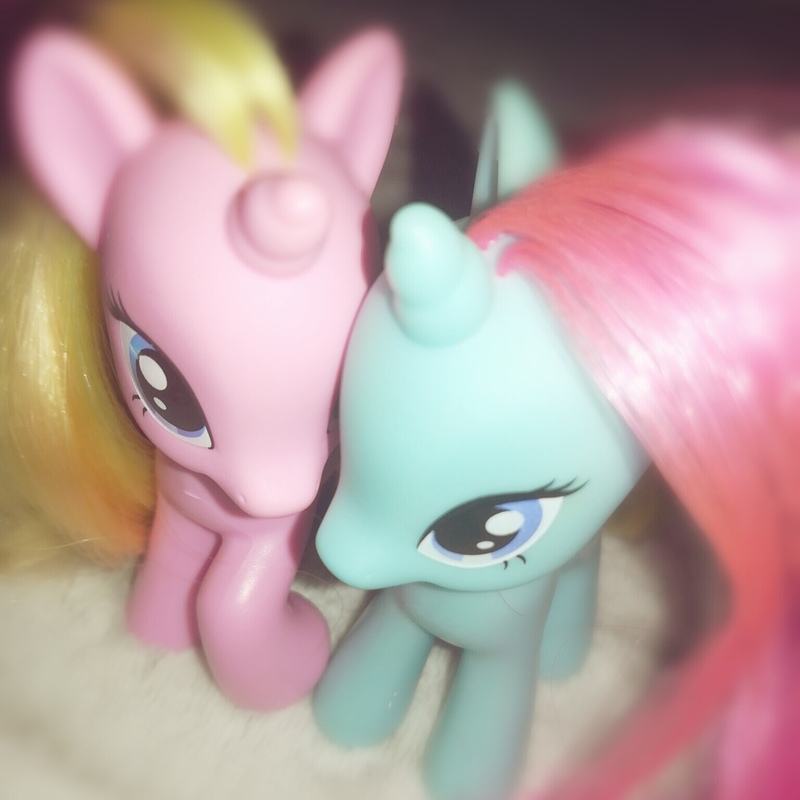 I was quicker with buying these two ponies than with finishing this posting, my mind just went "ohh ponies on sale!!!" and that was it. I've found the Unicorn and Pegasus sets (and Starflower & Pinwheel) in this shop: https://www.fivelittlediamonds.co.uk/collections/35th-anniversary-my-little-pony but it does not say when they will be available, only that they are coming soon. Haven't seen them on amazon yet! the unicorns are july, i believe. i think fivelittlediamonds has all of the rainbows and unipegs for july too. So do allthecoolstuff I believe. It;s not on their website but I emailed them and they confirmed they were expecting them around July in a summer wave. Unicorns and pegasus preorder dates for Amazon UK if we believe that is June 1st but we'll see if that is translated onto store shelves as well. I am hoping so. They show up towards the bottom. I think the higher prices for Confetti etc are non-Amazon as the RRP for them here is £12.99 and the prime price is also £12.99. Medley's listing still seems to think she's a leather phone case (looking at the product details and the URL, lol). The French boxes Bibi posted pictures of in the other thread suggested September for Pinwheel and Starflower.